Early development of many species depends on the temporal and spatial control of maternal gene products. This review discusses the control of maternal mRNAs that encode regulators of C. elegans embryogenesis. In the C. elegans embryo, maternal mRNA regulation is crucial to the patterning of early cell fates. Translational control of key mRNAs spatially organizes cell signaling pathways, localizes transcription factor activities, and controls germ cell precursor development. From the few mRNAs studied thus far, some themes are beginning to emerge. Control of maternal mRNA translation begins in the hermaphrodite germ line. Distinct regulatory systems keep mRNAs silent during different stages of oogenesis, and lead to precise temporal and spatial patterns of translation in the embryo. In the embryo, cell polarity factors control the localization of translational regulators. Each maternal mRNA contains multiple elements in its 3' untranslated region (3' UTR) that specify the timing and localization of translation. A relatively small number of RNA-binding proteins likely control many mRNAs through these 3' UTR elements. Therefore, the combination of RNA elements and the regulatory complexes recruited to them specify unique patterns of translation for different mRNAs. The mechanisms of translational control are only beginning to be explored, but are likely to regulate diverse developmental and cellular events in metazoans. Early development of C. elegans embryos requires the localization of maternal gene products to specific cells at specific times. Three general mechanisms have been described for localizing maternal regulators in the embryo; directed movement or local trapping of maternal proteins, localized stabilization of maternal proteins, and localized translation and stability of maternal mRNAs (see Asymmetric cell division and axis formation in the embryo). This chapter reviews the translational regulation of maternal mRNAs that encode key regulators of early embryonic cell fates. We discuss how a few well-studied mRNAs are controlled, and how their control is connected to germ cell development and early embryonic polarity. We define "translational control" loosely, as control of protein accumulation by elements within the mRNA, even though the translation process itself may not be the primary target of regulation. In eukaryotes, translational control factors regulate a diverse array of developmental and cellular processes, thus studies of C. elegans maternal mRNAs will likely illustrate general mechanisms and principles (Kuersten and Goodwin, 2003; Wilkie et al., 2003). Most maternal mRNAs destined for the embryo are transcribed by germ cell nuclei in mitosis or early stages of meiosis. These germ nuclei not only make maternal mRNAs but must also proceed through meiosis and oogenesis (see Introduction to the germ line). Perhaps it is not surprising then that the translation of many maternal mRNAs is repressed during female gamete development (Table 1). This tight regulation is likely necessary to prevent interference with oocyte development and is essential to allow specific patterns of protein accumulation to arise in the embryo. We limit our discussion to mRNAs that function in the embryo. For discussion of the regulation of other classes of germline RNAs, see Kuersten and Goodwin (2003). PAL-1 is the C. elegans caudal homolog and patterns posterior embryonic development (Edgar et al., 2001; Hunter and Kenyon, 1996). Translation of maternal pal-1 mRNA is repressed in the germ line and early embryo until the four-cell stage when PAL-1 protein accumulates rapidly in the two posterior cells (Hunter and Kenyon, 1996). In the germ line, the KH domain proteins GLD-1 and MEX-3 repress PAL-1 translation (Mootz et al., 2004). GLD-1 has been implicated in the regulation of many maternal mRNAs while pal-1 remains the only known target of MEX-3 (see RNA-binding proteins). These two proteins are reciprocally localized in the germ line; GLD-1 is restricted to early stage meiotic germ cells of the distal germ line, and MEX-3 is restricted to differentiating oocytes of the proximal germ line (Draper et al., 1996; Jones et al., 1996). Therefore, repression of pal-1 must be transferred from general gld-1 control to more specific mex-3 control during oogenesis. GLD-1 and MEX-3 function via the pal-1 3' UTR to repress translation (Hunter and Kenyon, 1996; Mootz et al., 2004). Two broad regions of the 3' UTR effect repression in the distal germ line and one of these contains an element referred to as the germline repression element (GRE). The GRE efficiently represses translation in the distal germ line and this repression requires GLD-1, which also directly or indirectly binds to the GRE (Mootz et al., 2004). Interestingly, RNAi depletion of gld-1 does not result in strong PAL-1 expression in the distal germ line, but does cause high distal expression of MEX-3. 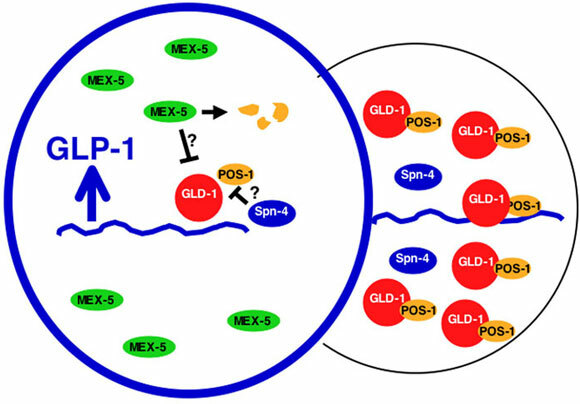 Double RNAi of gld-1 and mex-3 results in strong accumulation of PAL-1 throughout the gonad. Therefore, GLD-1 patterns germline repression of PAL-1 by both repressing pal-1 mRNA and the pal-1 regulator MEX-3. Additional elements also contribute to pal-1 repression in the germ line (Mootz et al., 2004). pal-1 and mex-3 mRNAs co-sediment with polysomes in sucrose gradients even when PAL-1 and MEX-3 proteins are undetectable (Mootz et al., 2004). This result suggests that GLD-1 represses these mRNAs after initiation of translation. GLD-1 may inhibit translation elongation or termination, or may promote degradation of nascent polypeptides on these mRNAs before they are released. Consistent with the idea of stalled translation is the apparent partial translation of a GFP::Histone fusion protein during GRE-mediated repression. In the distal germ line, where gfp::his-11::GRE mRNA is repressed, mature GFP is detected at low levels in the cytoplasm (Mootz et al., 2004). In the proximal germ line, where gfp::his-11::GRE mRNA is active, the fusion protein is abundant and nuclear. Because GFP folds slowly and HIS-11 efficiently localizes to nuclei, these observations indicate that translation and release of these fusion proteins are considerably slowed in the distal germ line. In addition, GLD-1-dependent repression protects mRNA with premature stop codons from nonsense-mediated decay, consistent with suppression prior to the completion of translation termination (Lee and Schedl, 2004). MicroRNA-mediated repression of heterochronic mRNAs may occur by a similar post-initiation mechanism in larvae (Olsen and Ambros, 1999; Seggerson et al., 2002). Indeed, we find that components of the microRNA pathway are required for repression of GRE-regulated reporters and that the pal-1 GRE contains conserved potential microRNA binding domains (Mootz Ph.D Thesis, 2002; J. Brooks and C.P. Hunter, in preparation; C.P.H. unpublished). The rapidity of early embryonic development provides a raison d'être for post-initiation repression, which bypasses the often rate-limiting step of translation initiation. The mRNA encoding the Notch membrane receptor, GLP-1, is also tightly regulated during oogenesis. Like pal-1, glp-1 mRNA translation is repressed in both the distal and proximal germ line by sequences in its 3' UTR (Evans et al., 1994; Marin and Evans, 2003). At least two separate RNA elements contribute to glp-1 repression during oogenesis. One element, also called the GRE, represses translation during early gamete development, but contributes only weakly to repression during later stages of oogenesis (Marin and Evans, 2003). A second distinct element is required for repression in oocytes of the proximal germ line (Evans et al., 1994). Once again, the key regulator for distal germ line repression is the KH domain protein GLD-1. GLD-1 is required for glp-1 repression in early meiotic prophase, binds directly to glp-1 RNA, and both GLD-1 binding and repression are specifically dependent on five nucleotides of the glp-1 GRE RNA sequence (Marin and Evans, 2003). The glp-1 GRE is probably directly contacted by GLD-1, since these 5 nucleotides were independently predicted to reside in a "relaxed consensus" GLD-1 binding site (Ryder et al., 2004). The pal-1 GRE also contains potential relaxed consensus GLD-1 sites that are similar but not identical to the glp-1 GRE. During late oogenesis, glp-1 mRNA repression requires the pumilio-like RNA-binding proteins PUF-5, PUF-6, PUF-7, and PUF-10, although it is not known if these proteins act directly or indirectly (A. Lublin and T. Evans, unpublished). Interestingly, PUF-5 expression is restricted to the proximal germ line, and this restriction may be mediated by GLD-1, which binds to and possibly represses puf-5 and puf-6/7/10 mRNAs in the distal germ line (Lee and Schedl, 2001). Therefore, like pal-1, the translational repression of glp-1 mRNA during oogenesis requires two distinct regulatory systems that are spatially and temporally segregated in the germ line. For glp-1, these two systems may function through distinct 3' UTR elements. Neither GLD-1 nor PUF-5 are expressed in the most proximal oocyte or in the one-cell zygote (Jones et al., 1996; A. Lublin and T. Evans, unpublished). Yet, glp-1 mRNA is tightly repressed through these stages suggesting that a third regulatory system functions after oocyte maturation and fertilization to keep glp-1 silent until the two-cell stage (Evans et al., 1994). Several other maternal mRNAs encoding key embryonic regulators are known or are likely to be repressed during oogenesis (Table 1). Although the control mechanism is not known for most of these genes, at least nos-2 repression requires 3' UTR elements (K. Subramaniam and G. Seydoux, personal comm.). In addition, GLD-1 is necessary for distal repression of several maternal mRNAs (e.g., mex-3, spn-4, oma-1, and oma-2), and others are predicted to contain GLD-1 binding sites (Lee and Schedl, 2004; Mootz et al., 2004; Ryder et al., 2004). Therefore, it seems likely that most of these maternal RNAs are subject to translational repression, and GLD-1 probably regulates many of them in early oogenesis. pie-1 Repressed15 GLD-112? Active15 ?? Active in all cells16 ?? gld-1 Activea,17 NOS-3, GLD-2[a],18 Repressed17 ?? Localized in posterior17 ?? mex-3 Repressed19 GLD-18 Active19 ?? Localized in anterior18 ?? spn-4 Repressed5,8 GLD-18 Active5,8 ?? Localized in posterior?5,8 ?? pos-1 Repressed13 ?? Repressed13 ?? Active in all cells?16 ?? mex-5 mex-6 Repressed6 GLD-18 Active6 ?? Localized in anterior?6 ?? skn-1 Repressed20 ?? Active20 ?? Localized in posterior?20 ?? pop-1 Repressed21 ?? Active21 ?? Active in all cells?21 ?? oma-1 oma-2 Repressed22 GLD-123 Active22 ?? Repressed?22 ?? a"Translation in the Distal Germ line" refers only to the meiotic region of the distal arm. However, gld-1 and maybe other mRNAs are further controlled within the mitotic region near the distal tip; gld-1 is repressed in mitotic germ cells by the PUF proteins FBF-1 and FBF-2 (Crittenden et al., 2002). bRegulation of translation by RNA elements has only been shown for a few mRNAs. Some maternal proteins could be regulated after translation, particularly in the embryo (see text). cRegulators may act directly or indirectly; direct interactions with RNAs have been shown in only a few cases.
? –Some suggestive support but data is incomplete to varying extents. ?? – Regulators or activity is unknown. Maternal RNAs that have been silenced in the germ line are translated in specific spatial and temporal patterns in the early embryo (Figure 1; Table 1). Because early cell cycles are rapid and polarity cues are established in the first one or two cycles, maternal mRNA controls must be precise and efficient. Several putative RNA binding proteins that are required for maternal RNA translation patterns have been identified. However, many of these proteins regulate multiple processes, including those that establish or maintain embryonic polarity. Thus, identification of their direct RNA targets, their protein partners, and their mechanisms of control will be necessary to disentangle the complex networks that control early embryogenesis. Figure 1. Cell fate regulators are localized to specific blastomeres of the 4-cell embryo. 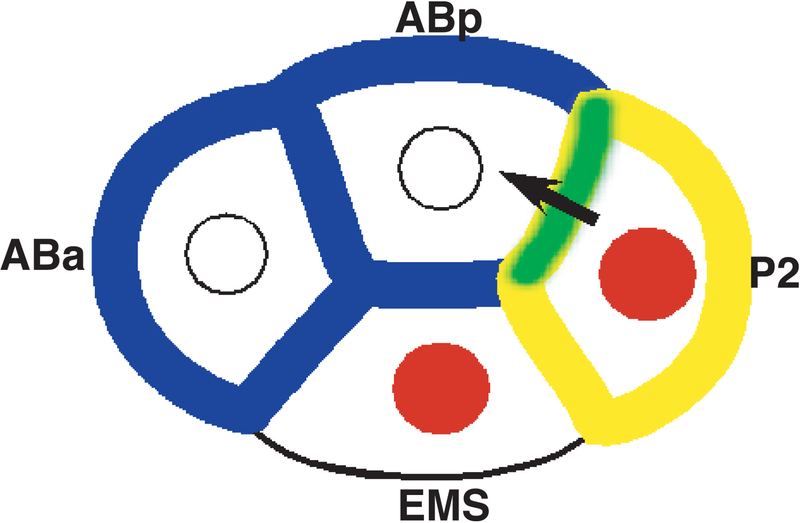 APX-1/Delta is localized to the posterior blastomere P2 (yellow), where it concentrates in the contact zone between P2 and ABp (green; Mickey et al., 1996). GLP-1/Notch (blue) is localized to anterior blastomeres (ABa and ABp). APX-1 interacts with GLP-1 (green) to induce ABp’s fate (arrow; Mango et al., 1994; Mello et al., 1994). The transcription factor PAL-1 is localized to posterior nuclei (red) and ultimately to the C and D blastomeres, where it controls muscle and epidermal specification (Hunter and Kenyon, 1996; Baugh, 2005). In the early C. elegans embryo, Notch signaling between posterior and anterior blastomeres regulates the specification of anterior cell lineages (Figure 1; Mango et al., 1994; Mello et al., 1994; Priess et al., 1987). Expression of the Notch receptor GLP-1 begins at the 2-cell stage, but is restricted to anterior cells (Evans et al., 1994). In contrast, the Notch ligand APX-1 is localized to a single posterior blastomere at the 2- and 4-cell stages (Mickey et al., 1996). The localization of these membrane proteins is critical to spatially constrain Notch signaling to specific anterior cells at specific times, which controls patterning of anterior fates (Mango et al., 1994; Mello et al., 1994; Shelton and Bowerman, 1996). Their reciprocal expression patterns may be regulated by common components. GLP-1 localization is achieved by translational control through a small region of the glp-1 3' UTR (Evans et al., 1994; Marin and Evans, 2003). The same GRE element that represses distal germ line translation also represses translation in posterior blastomeres of the embryo (Marin and Evans, 2003). Indeed, GLD-1, expressed anew in the embryo, mediates at least part of this repression but it does not act alone (Jones et al., 1996; Marin and Evans, 2003). The posteriorly localized CCCH finger protein POS-1 is also necessary for posterior repression of glp-1, and interacts with a region of the glp-1 3' UTR containing the GRE (Ogura et al., 2003). In vitro, POS-1 binds directly to GLD-1, and together these proteins form a complex with glp-1 RNA (V. Marin and T. Evans, unpublished). Thus, POS-1 may function as an embryo-specific co-repressor with GLD-1. These and other in vitro experiments suggest that GLD-1 is the key determinant of RNA-binding specificity for some GLD-1 targets (Jan et al., 1999; Lee and Schedl, 2001; Marin and Evans, 2003; Ryder et al., 2004). Perhaps, in these cases, POS-1 and other GLD-1 co-factors modify RNA binding specificity or modulate general translation factors that are recruited to the mRNA. POS-1 is also required to activate APX-1 expression in the posterior (Tabara et al., 1999). It is not known if POS-1 acts directly on apx-1 mRNA, or whether GLD-1 also functions in this process. This finding suggests the spatial organization of Notch signaling in the embryo may be coordinated by a common translational control system. How POS-1 can directly or indirectly mediate both repression and activation in the same cell is a mystery. How is glp-1 translation localized in the embryo? Although both GLD-1 and POS-1 are progressively localized to posterior blastomeres, the answer is not so simple as posterior restriction of repressors (Jones et al., 1996; Tabara et al., 1999). Translation of glp-1 mRNA must be activated in the anterior. Within the glp-1 3' UTR lies an element called the GDE that is directly adjacent to the GRE and promotes translation by inhibiting repression (Marin and Evans, 2003). This suggests that a de-repression factor binds the GDE to inhibit GLD-1/POS-1 function. A candidate for this de-repression factor is the RRM RNA-binding protein SPN-4 (Ogura et al., 2003). Genetic experiments show that SPN-4 promotes GLP-1 expression by inhibiting POS-1 function. SPN-4 binds directly to POS-1 in vitro and can bind the glp-1 3' UTR, however it seems to prefer sequences outside of the GRE/GDE region. Other candidate derepression factors are the anterior-localized redundant proteins MEX-5 and MEX-6, which are required for glp-1 activation in anterior cells (Schubert et al., 2000). Regardless of regulator composition, these studies suggest that localization of Notch translation involves localization of repressors to posterior cells and inhibition of residual repressor activity in anterior cells (Figure 2). Figure 2. Model for localized translation of Notch/GLP-1. In the posterior, GLD-1 and POS-1 accumulate and repress glp-1 mRNA (wavy blue line). In the anterior, GLD-1 and POS-1 expression is repressed; POS-1 is degraded by a process requiring MEX-5/6 (Reese et al., 2000; Schubert et al., 2000). In addition, a derepressor directly inhibits residual GLD-1/POS-1 complexes in the anterior to promote translation. The derepressor factor is unknown (? ), but the RNA binding proteins SPN-4 and MEX-5/6 are candidate components. The activity of the homeodomain protein PAL-1 is targeted to the somatic descendants of the posterior blastomere P2 where it initiates a transcription-regulatory network that specifies the C and D blastomere lineages (Hunter and Kenyon, 1996; Baugh et al., 2005). PAL-1 translation is repressed in oocytes and early embryos until the four-cell stage when PAL-1 accumulates in the two posterior cells (Figure 1). A key factor that regulates this pattern of expression is the KH-domain protein MEX-3, which acts through the pal-1 3' UTR to repress PAL-1 expression and whose localization in oocytes and early embryos is reciprocal to that of PAL-1. 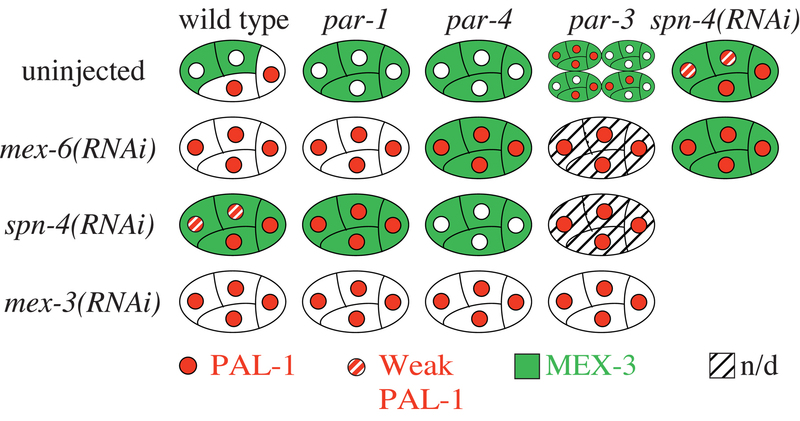 Mutations in the par genes, which explicitly disrupt embryonic polarity (see Asymmetric cell division and axis formation in the embryo), reveal complexities in MEX-3 control of pal-1 (Huang et al., 2002; Hunter and Kenyon, 1996). Embryos mutant for par-1 or par-4 maintain uniform MEX-3 levels in anterior and posterior blastomeres and fail to express PAL-1. Because par-1; mex-3 and par-4; mex-3 double mutant embryos express PAL-1 in oocytes and all early embryonic blastomeres, mislocalized MEX-3 is active in par-1 and par-4 single mutants. In contrast, embryos mutant for par-3 similarly cause uniform MEX-3 localization, but PAL-1 is expressed in some blastomeres beginning at the 4-cell stage. Therefore, the mere presence of MEX-3 is insufficient to maintain repression. MEX-5/MEX-6 and SPN-4 were identified as MEX-3 binding proteins that are also required for repression of PAL-1 (Huang et al., 2002). MEX-5 and MEX-6 are homologous CCCH Zn-finger proteins required for embryonic polarity (Cuenca et al., 2003; Page et al., 2001; Schubert et al., 2000). RNAi of mex-5/6 causes loss of MEX-3 from anterior as well as posterior blastomeres and PAL-1 is derepressed in all four blastomeres (Huang et al., 2002; Schubert et al., 2000; Figure 3). SPN-4 is an RRM protein required for a variety of posterior-specific events (Gomes et al., 2001; Huang et al., 2002; Ogura et al., 2003). SPN-4 also controls the localization of MEX-3 (Huang et al., 2002). Therefore, both MEX-5/MEX-6 and SPN-4 regulate pal-1 translation indirectly by controlling MEX-3 expression. These factors probably control MEX-3 stability since separate MEX-3 domains, when fused to GFP, can confer mex-5/mex-6 and spn-4-dependent stability and instability on GFP (N. Huang and C. Hunter in preparation). Analysis of MEX-3 and PAL-1 localization in various double RNAi embryos is consistent with multiple parallel processes acting on MEX-3 localization, which in turn affects PAL-1 accumulation (Figure 3; Huang et al., 2002). Figure 3. Summary of MEX-3 and PAL-1 localization data in wild-type, mutant, and RNAi depleted embryos. These data show that MEX-3 localization and MEX-3 activity can be modulated independently, thus parallel pathways regulate the pattern of PAL-1 accumulation. Adapted from Huang et al. (2002). During early embryogenesis, the germ cell precursors are generated by a series of asymmetric cell divisions (see Specification of the germ line). The control of maternal mRNAs is likely to be essential to germ cell specification, since general transcription is silenced in germ cell precursors and several putative RNA-binding proteins are localized to them (see Specification of the germ line). Among these factors include our old friends GLD-1, POS-1, and MEX-3, several other CCCH finger proteins including MEX-1, OMA-1, and PIE-1, the RNA helicase GLH proteins, and the RGG protein PGL-1 (see Specification of the germ line). PIE-1, MEX-1, MEX-3, and POS-1 are essential for regulating germ cell fate, and the GLH proteins and PGL-1 control aspects of germ cell development (see Specification of the germ line). One maternal mRNA that is controlled in the germ cell precursors is nos-2, a worm homolog of fly nanos (Subramaniam and Seydoux, 1999). NOS-2 is expressed only after the penultimate primordial germ cell (PGC) is produced, and at least part of this specificity depends on nos-2 3' UTR elements (K. Subramaniam and G. Seydoux, personal comm.). PIE-1 is necessary for nos-2 activation, independent of its role in transcriptional silencing, and thus could act as a translational activator (Tenenhaus et al., 2001). Furthermore, NOS-1 and NOS-2 proteins are needed for germ cell migration and proliferation, and Nanos proteins themselves are implicated in mRNA regulation (Macdonald, 2001; Subramaniam and Seydoux, 1999). Indeed, several PUF proteins may function as partners with NOS-2 and/or NOS-1 to regulate as yet unidentified mRNAs (Subramaniam and Seydoux, 1999). Therefore, early germ cell specification and control in the embryo may involve cascades of RNA regulation. First, regulation of maternal mRNA translation begins in the germ line, where spatial organization of oogenesis mirrors spatial patterning of maternal RNA control. This early translational repression may be as important to meiosis and oogenesis as it is to allowing spatial and temporal patterns of embryonic expression to emerge after fertilization. For each maternal RNA, distinct factors assemble onto RNA elements in different spatiotemporal domains of the gonad, apparently to manage message specific expression patterns in the embryo. Second, regulated maternal mRNAs generally contain multiple elements within their 3' UTRs. Some elements are redundant while others have unique functions. These elements act combinatorially to create specific patterns of translation. Third, a relatively small collection of regulators may control many different mRNAs (see Table 1; see also RNA-binding proteins). GLD-1 mediates translational repression of many mRNAs in the distal germ line while apparently more specific factors control translation in late stage oocytes and early embryos. However, even these "specific" factors probably have multiple mRNA targets. Remarkably, some regulators can simultaneously promote or repress translation of different mRNAs, even within the same cell. These conflicting functions could be indirect (e.g., activation could be due to repression of repressor expression). Alternatively, some regulatory factors may exist in distinct complexes that have different activities. To achieve a specific pattern of translation, each mRNA may recruit a specific combination of complexes to its RNA elements, which then results in translation in a specific cell and at a specific stage. The mechanisms of translational control are poorly understood. Polysome analysis of pal-1 suggests a post-initiation repression mechanism, which might be poised for rapid derepression in the embryo (Mootz et al., 2004). This mechanism may be similar to microRNA-mediated regulation in worms, and may be common to other organisms as well (Clark et al., 2000; Olsen and Ambros, 1999; Seggerson et al., 2002). In addition, various observations suggest that control of translation initiation and polyA tail regulation does occur for some C. elegans mRNAs (Ahringer and Kimble, 1991; Ahringer et al., 1992; Goodwin et al., 1993; Wang et al., 2002). Beyond this little is known. Many questions remain to be answered. For example, how can RNAs like pal-1 and glp-1 be translationally repressed by GLD-1 in the germ line but translated in opposing patterns in the embryo? What is the composition of translational control complexes? Do they contain small RNAs? How do these complexes recognize their targets and how do they communicate with the translation machinery and other general factors? How are translational control activities spatially and temporally regulated in the embryo? These questions will provide the fuel for exciting research in the future. We would like to thank K. Subramaniam and G. Seydoux for providing unpublished information. Work in T.C.E's laboratory was supported by grants from NSF (9982944, 0345386), U. Colo. Cancer Center and ACS, and NIH (GM20599-03). C.P.H. gratefully acknowledges NIH (GM616677) for support to study translational control mechanisms. Gomes, J.E., Encalada, S.E., Swan, K.A., Shelton, C.A., Carter, J.C., and Bowerman, B. (2001). The maternal gene spn-4 encodes a predicted RRM protein required for mitotic spindle orientation and cell fate patterning in early C. elegans embryos. Development 128, 4301–4314. *Edited by James R. Priess and Geraldine Seydoux. Last revised November 07, 2005. Published November 10, 2005. This chapter should be cited as: Evans, T.C. and Hunter, C.P. Translational control of maternal RNAs (November 10, 2005), WormBook, ed. The C. elegans Research Community, WormBook, doi/10.1895/wormbook.1.34.1, http://www.wormbook.org. Copyright: © 2005 Thomas C. Evans and Craig P. Hunter. This is an open-access article distributed under the terms of the Creative Commons Attribution License, which permits unrestricted use, distribution, and reproduction in any medium, provided the original author and source are credited.